When a seller provides goods or services on credit, the resultant account receivable is normally considered to be an unsecured claim against the buyer's assets. This makes the seller (the supplier) an unsecured creditor, meaning it does not have a lien on any of the buyer's assets—not even on the goods that it just sold to the buyer. Sometimes a supplier's customer gets into financial difficulty and is forced to liquidate its assets. In this situation the customer typically owes money to lending institutions as well as to its suppliers of goods and services. In such cases, it's the secured creditors (the banks and other lenders that have a lien on specific assets such as cash, receivables, inventory, equipment, etc.) who are paid first from the sale of the assets. Often there is not enough money to pay what is owed to the secured lenders, much less the unsecured creditors. In other words, the suppliers will never be paid what they are owed. To avoid this kind of risk, some suppliers may decide not to sell anything on credit, but require instead that all of its goods be paid for with cash or a credit card. Such a company, however, may lose out on sales to competitors who offer to sell on credit. To minimize losses, sellers typically perform a thorough credit check on any new customer before selling to them on credit. They obtain credit reports and check furnished references. Even when a credit check is favorable, however, a credit loss can still occur. For example, a first-rate customer may experience an unexpected financial hardship caused by one of its customers, something that could not have been known when the credit check was done. The point is this: any company that sells on credit to a large number of customers should assume that, sooner or later, it will probably experience some credit losses along the way. Accounts receivable are reported as a current asset on a company's balance sheet. Since current assets by definition are expected to turn to cash within one year (or within the operating cycle, whichever is longer), a company's balance sheet could overstate its accounts receivable (and therefore its working capital and stockholders' equity) if any part of its accounts receivable is not collectible. To guard against overstatement, a company will estimate how much of its accounts receivable will never be collected. This estimate is reported in a balance sheet contra asset account called Allowance for Doubtful Accounts. (Some companies call this account Provision for Doubtful Accounts or Allowance for Uncollectible Accounts.) Any increases to Allowance for Doubtful Accounts are also recorded in the income statement account Bad Debts Expense (or Uncollectible Accounts Expense). As we stated above, the account Allowance for Doubtful Accounts is a contra asset account containing the estimated amount of the accounts receivable that will not be collected. For example, let's assume that Gem Merchandise Co.'s Accounts Receivable has a debit balance of $100,000 at June 30. Gem anticipates that approximately $2,000 of this is not likely to turn to cash, and as a result, Gem reports a credit balance of $2,000 in Allowance for Doubtful Accounts. The accounting entry to adjust the balance in the allowance account will involve the income statement account Bad Debts Expense. With Allowance for Doubtful Accounts now reporting a credit balance of $2,000 and Accounts Receivable reporting a debit balance of $100,000, Gem's balance sheet will report a net amount of $98,000. Since this net amount of $98,000 is the amount that is likely to turn to cash, it is referred to as the net realizable value of the accounts receivable. Under the allowance method, the Gem Merchandise Co. does not need to know specifically which customer will not pay, nor does it need to know the exact amount. 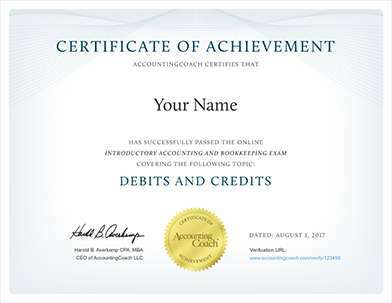 This is acceptable because accountants believe it is better to report an approximate amount that is uncollectible rather than imply that every penny of the accounts receivable will be collected. Gem's Bad Debts Expense will report credit losses of $2,000 on its June income statement. This expense is being reported even though none of the accounts receivables were due in June. (Recall the credit terms were net 30 days.) Gem is attempting to follow the matching principle by matching the bad debts expense as best it can to the accounting period in which the credit sales took place. Since the net realizable value of a company's accounts receivable cannot be more than the debit balance in Accounts Receivable, the balance in the Allowance for Doubtful Accounts must be a credit balance or a zero balance. Now let's assume that at July 31 the Gem Merchandise Co. has a debit balance in Accounts Receivable of $230,000. (The balance increased during July by the amount of its credit sales and it decreased by the amount it collected from customers.) The Allowance for Uncollectible Accounts still has the credit balance of $2,000 from the adjustment on June 30. This means Gem's general ledger accounts before the July 31 adjustment to Allowance for Uncollectible Accounts will be reporting a net realizable value of $228,000 ($230,000 minus $2,000). After this journal entry is recorded, Gem's July 31 balance sheet will report the net realizable value of its accounts receivables at $220,000 ($230,000 debit balance in Accounts Receivable minus the $10,000 credit balance in Allowance for Doubtful Accounts). As seen in the T-accounts above, Gem estimated that the total bad debts expense for the first two months of operations (June and July) is $10,000. It is likely that as of July 31 Gem will not know the precise amount of actual bad debts, nor will Gem know which customers are the ones that won't be paying their account balances. However, the matching principle is better met by Gem making these estimates and recording the credit loss as close as possible to the time the sales were made. By reporting the $10,000 credit balance in Allowance for Doubtful Accounts, Gem is also adhering to the accounting principle of conservatism. In other words, if there is some doubt as to whether there are $10,000 of credit losses or no credit losses, Gem's accountant "breaks the tie" by choosing the alternative that reports a smaller amount of profit and a smaller amount of assets. (It is reporting a net realizable value of $220,000 instead of the $230,000 of accounts receivable.) If a company knows with certainty that every penny of its accounts receivable will be collected, then the Allowance for Doubtful Accounts will report a zero balance. However, if it is likely that some of the accounts receivable will not be collected in full, the principle of conservatism requires that there be a credit balance in Allowance for Doubtful Accounts.